Hallock State Park Preserve, Riverhead Township, Suffolk Co.
We will meet at the visitor’s center for an introduction to the land use history of the park and then take a leisurely hike to the dunes and bluffs overlooking Long Island Sound looking at autumn wildflowers and interesting geological features including hoodoos, locally called “The Pinnacles.” The land was acquired in the 1960s for use as a sand mining operation by the Levon Corp. and, in the 1970s, by the Long Island Lighting Co. as the site for a proposed nuclear power plant. New York State purchased the property in 2002 and opened it to the public in 2017. Take the Long Island Expressway (I-495) east to exit 73, continue east on County Road 58 (aka Old Country Road) to Northville Turnpike, continue north to Sound Avenue and turn east for 3.4 miles to the park’s entrance (the visitor’s center is located off Sound Ave.). The address is: 6062 Sound Avenue, Jamesport. Explore the natural and cultural history of the old Floyd Estate on Moriches Bay. The 613 acres of property still has some record size trees that are among the largest of their kind, and the fields and woodlands are almost as they were when the Floyd/Nichols family donated the property to the National Park Service in 1976. We will walk through a variety of habitats and will discuss botany, cultural plantings, and a bit of ornithology too. Directions to the Estate in Mastic Beach are as follows: (don't use GPS as typically it takes people to the wrong gates!) Take LIE or Sunrise Hwy to William Floyd Parkway and head south. You will come to the large intersection of Montauk Hwy and WFParkway. Continue south on Floyd Parkway for app. another 3 miles. When you see the CVS Pharmacy on the left hand side of the road turn left at that light. This is Havenwood Drive, which quickly merges into Neighborhood Rd. Continue on Neighborhood Rd through Mastic Beach for 2 miles. Road ends on Park Drive, where you turn left. Go a few hundred yards down this road and find the large Entrance Gates on the right hand side of the road. Park in the lot at the end of the entrance road. Stillwell Wood is a 270-acre preserve/multi-use area with several interesting habitats, which include managed grassland, old field, Juniper and Oak woodlands. On this trip we will concentrate on the Oak woodlands, which are unique in Nassau County’s preserve system. Occurring on the County’s eastern border within the hills and ravines of the Harbor Hill Terminal Moraine, the sandy soils and flora present a habitat more typical of eastern Long Island’s pine/oak barrens. Please contact the trip leader to register in advance for this walk and in case we need to cancel due to weather. Insect repellent for ticks, sunscreen, water and a snack are recommended. Stillwell Woods is located next to 72 South Woods Road, behind the Town of Oyster Bay recreational fields, in Woodbury. Meet at the parking area at the farthest end from the South Woods Rd. entrance, past the recreation fields. Have you gotten past the formal gardens or the greenhouse? Planting Fields is over 400 acres, and has much natural habitat that we will explore. There are many fields and edges, as well as deciduous woods. 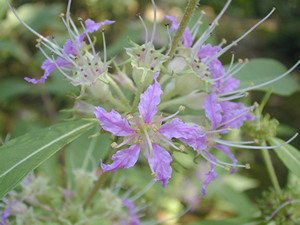 There is an extensive area of woodland that is predominated by Mountain Laurel and other ericaceous plants. This is also the time of year when the most diversity of plants in flower is to be expected in our area. Meet at the west end of the main parking lot. There is an entrance fee unless you have an Empire Pass. Please contact trip leader in advance in case we need to postpone or cancel due to weather. Insect repellent for ticks, sunscreen, water, and a snack are recommended. Meet at the west end of the main parking lot..